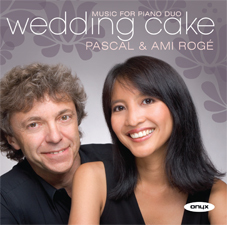 Music for two pianos, and four hands from husband and wife duo, Pascal and Ami Roge. From the glittering Wedding Cake of Saint-Saens, to the tender Dolly Suite by Faure this CD is a delightful recital of well known orchestral works in their lesser heard two piano arrangements. The disc also includes the world premiere recording of Paul Chihara's 'Ami', composed for Ami Roge.